Details: Enter the stage with Reloops new pro laptop stand. Enter the stage with Reloops new pro laptop stand. This convenient assistant – made of the most modern materials – space-saving and super flat when folded, is always by your side and stowable in almost every DJ bag. 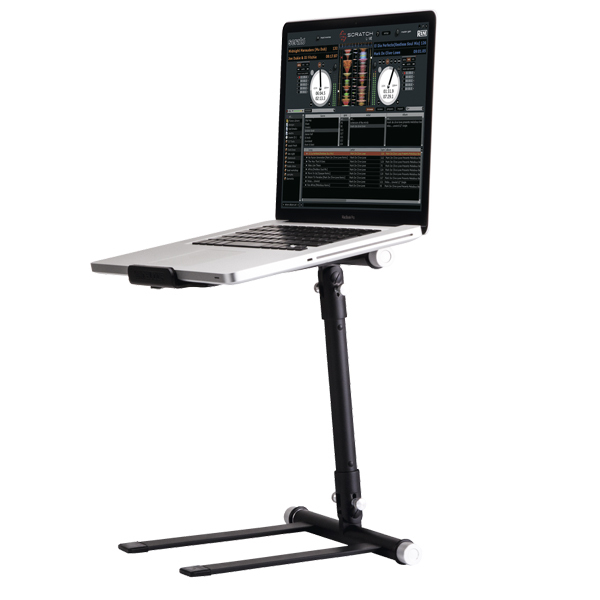 Whether used for your notebook or other equipment: Wherever an elevated work space is needed, this lightweight and nevertheless ultra sturdy laptop stand is the right choice, creating work space in every DJ booth, no matter how cramped, also thanks to the fast and easy assembly with only 2 hand movements. Stable and due to its latching point nearly indestructable, no tools or tedious assembly are necessary. This way your notebook is always on the right height and nothing will be missed in the mix.